Kopron were called to renovate the logistics area at the ‘Babini’ Army Barrack near Novara. 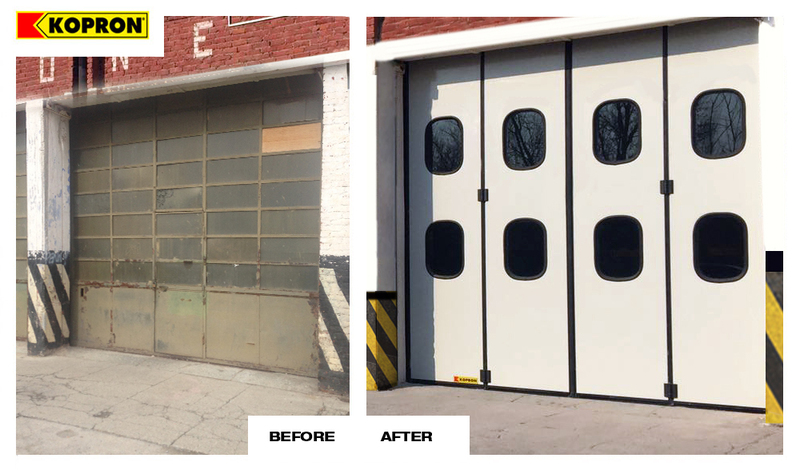 Customer required new modern and functional folding doors to guarantee easy passage of vehicles. 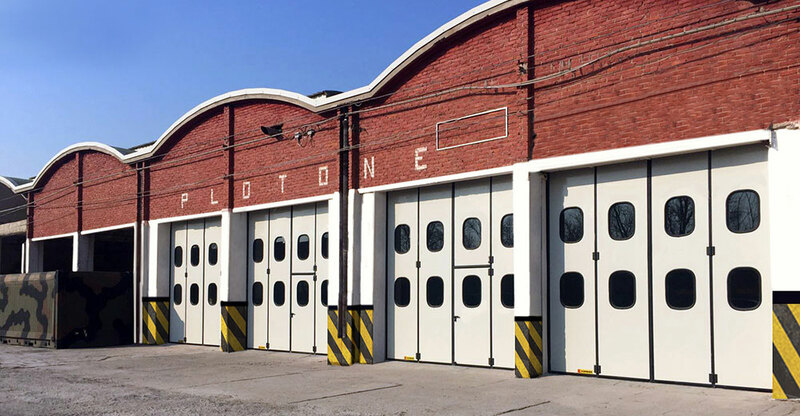 Kopron recently cooperated with the Reception, Staging, Onward Staging dept (RSOM) of the Italian Army located near Novara, which relied on Kopron’s know-how to renovate their logistics area. 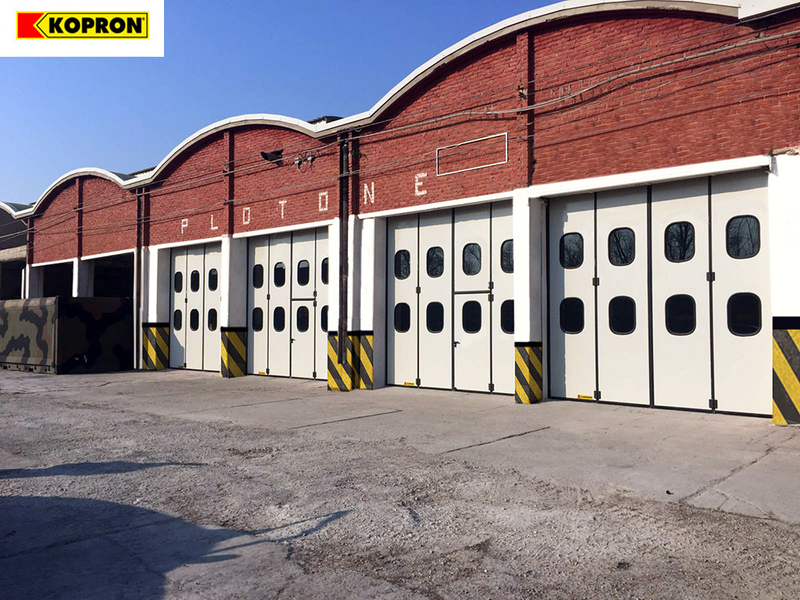 Kopron supplied four folding doors all motorized without ground tracks. Each door consists of four wings which fold in two with a 180° rotation. The four doors installed have motorized wings in painted steel guides, with CFC free polyurethane foam filling, this to guarantee the best thermal-acoustic insulation effect. Special EPDM gaskets and nylon brushes along profiles assure excellent tightness. The vision panels inserted in each wing (tot. 16) have a double function: to let in natural light enabling visibility both ways inside and outside for further safety. Fast opening/closing movements guaranteed by motor systems, and also the sizes of the doors - 4mt large and 4.5 m tall, are a further guarantee of efficiency for vehicles which come and go from the barrack. All folding doors are designed by Kopron’s technical team strictly according to customer’s specific needs, and have all been produced at Kopron’s production pole located in Southern Italy near Bari- Kopron Puglia, specifically dedicated to this kind of product. “The supply of doors is part of a great project of functional and aestethic upgrading of the whole barrack”said customer with satisfaction “we managed this way to optimize the logistics area dedicated to the passage of vehicles coming and going from the Hanger”.